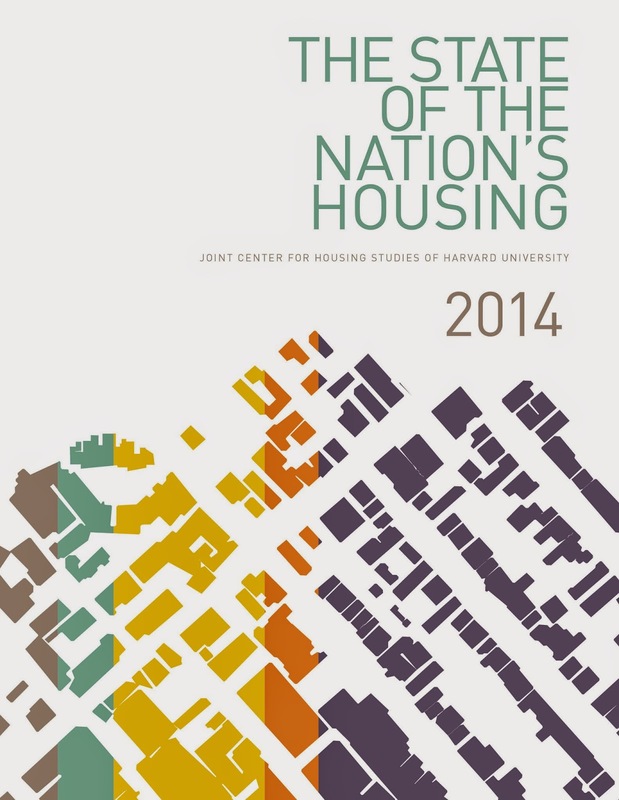 The U.S. housing recovery should regain its footing, but also faces a number of challenges, concludes The State of the Nation’s Housing report released today by the Joint Center. Tight credit, still elevated unemployment, and mounting student loan debt among young Americans are moderating growth and keeping millennials and other first-time homebuyers out of the market. The housing recovery is following the path of the broader economy. As long as the economy remains on the path of slow, but steady improvement, housing should follow suit. Although the housing industry saw notable increases in construction, home prices, and sales in 2013, household growth has yet to fully recover from the effects of the recession. Young Americans, saddled with higher-than-ever student loan debt and falling incomes, continue to live with their parents. Indeed, some 2.1 million more adults in their 20s lived with their parents last year, and student loan balances increased by $114 billion. Still, given the sheer volume of young adults coming of age, the number of households in their 30s should increase by 2.7 million over the coming decade, which should boost demand for new housing. Ultimately, the large millennial generation will make their presence felt in the owner-occupied market, just as they already have in the rental market, where demand is strong, rents are rising, construction is robust, and property values increased by double digits for the fourth consecutive year in 2013. One key to realizing the millennials’ potential in the housing market is for the economy to grow to the point where their incomes start to rise. Another important factor is how potential GSE reform will affect the cost and availability of mortgage credit for the next generation of homebuyers, which will be the most diverse in the nation’s history. By 2025, minorities will make up 36 percent of all US households and 46 percent of those aged 25–34, thus accounting for nearly half of the typical first-time homebuyer market. 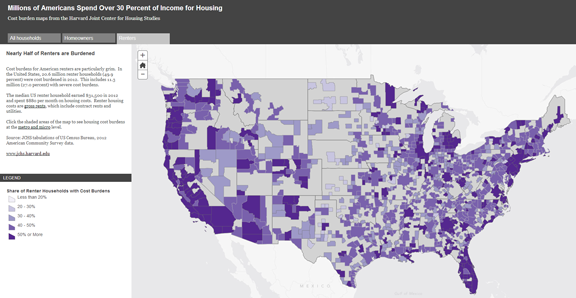 The report, as well as an interactive map released by the Joint Center, also highlights the ongoing affordability challenge facing the country, as cost burdens remain near record levels and over 35 percent of Americans spend more than 30 percent of their income for housing. The situation is particularly grim for renters, where 50 percent are cost burdened and 28 percent are severely cost burdened (meaning they spend over half of their income for housing). Click map to launch; may take a few seconds to load. When available, federal rental subsidies make a significant difference in the quality of life for those struggling the most. Between 2007 and 2011, the number of Americans eligible for assistance rose by 3.3 million, while the number of assisted housing units was essentially unchanged. Sequestration forced further cuts in housing assistance, which have yet to be reversed. What Drives the Decision to Rent vs.Own?